PNB does not need immediate capital allocation? Markets staged a smart comeback from the start of this week. Nifty tested the 10300 level and closed smartly near 10500. Week on week close although flat – sentiment improved owing to Friday rally. Caution is still the word on the street. Small and mid caps continue to under-perform. PNB scam is still being digested as the nation comes to senses after the recent jolt. Banks are still the focus. Sentiment remains soured as far as bulls are concerned. FII is still a regular seller in our markets. DII keeps absorbing the selling. Technically Nifty is long way away from being safe. This is the longest period in recent past it has failed to re-conquer 50d EMA. 10550 will be key along with its last high 10600. It is nearing the supply zone. Sell on rally will still be the catch word as long as 10600-650 is not covered. On the down side the line of last support clearly stands at 10300-250. Below this further selling can be expected. Starting of the new F&O series has been on the lighter note as well. Fundamentals have not changed. Some green shots here and there but still market is pricing a growth which has not come. Correction has been deeper in some stocks which may have provided good openings. Over all sense is still overvaluation. At north of 25x PE future returns have not been that great historically. Hence a bit of caution is still advised. Sector speak – Keep an eye on Pharma stocks. The index has shown good bounce near its last support. Nifty pharma can scale another 5% if the lows of last week hold. As expected NIFTY IT continues to do well. Can see some minor pull back – however is strongest of the lot. Keep an eye on its constituents. 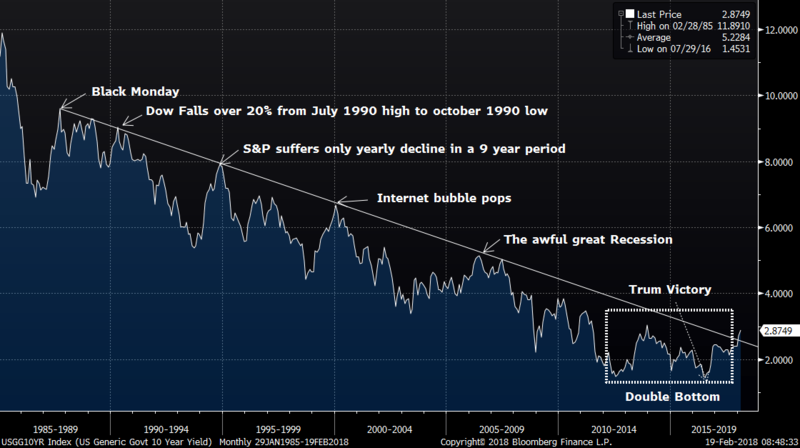 The down trend line adjoining 1988 top has been broken out indicating big reversal in falling rate cycle. Since hitting an all-time of 15.84 percent in September 1981, the yield on the U.S. 10-year has been steadily declining. The US 10 year Treasury bond yield formed bottom at 1.3180 in July 06, 2016 and touched high of 2.9424 on February 15, 2018. The yield price almost doubled in last 1 ½ years, entering in a phase not seen in 72 years. Historical analysis suggest that Interest rate cycles are longer, typically stretching 22 to 37 years. This new rate cycle could last at least two decades, introducing a whole new class of investors to rising rates. This meant a lot for all as rise in interest rate would directly or indirectly raise the cost of goods and services. This is might be the first sign of rising inflation on global front which will lead to change in sentiment/ behavior of global financial market. The people likely to reduce exposure in equity market and will move towards bond as real interest rates would be higher. The correlation between S&P 500 and US 10 year yield remains positive below 4% while concern rises once the yield starts moving above 4.50%. As bond market discounts four rate hikes for 2018, some experts believe the recent development would lead to end of bull market in equity market. With rising interest rate and unwinding of easy liquidities would impact emerging market (EM) equities. The foreign fund likely to move from EM to DM, as real interest would rise along with growth in economy attracts better valuation for their equity as well. Markets had a flat week closing wise. There was quite some action during the week price wise. Nifty gave up the 10600 levels very easily to close near last weeks close of 10450 levels. Sentiment is hit across the street. PNB scam has led to an over all pessimism and uncertainty is back. This can be seen with the price action in PNB itself. Players are still not confirmed how deep this scam will be and what skeletons will tumble from the closet. Having said that fear has definitely gripped the market participants. Caution has been over played. Mid and Small caps have resumed their downwards movement. Technically looking, Nifty did not scale back its 50D EMA around 10600. It chose to fall back from those exact levels. The downward play is open till 10000 should the last lows of 10270 fail to hold. It will be a classic test of recent lows before market is sure what it can hold. If 10300 gives way another slide of 5% cannot be ruled out. On the upside 10600 is the level to watch out for positional traders. 10000 remains the ultimate test. It is also the 50W EMA and 200D EMA. Lot of smart money will be watching these levels in the days and weeks to come. Fundamentally we have not moved a needle. Although some consolidation is welcomed. Multiples are still stretched beyond historical averages. P/Es still above 25x after topping out at 27-28x in January. Things are still very overvalued and a further fall cannot be ruled out. A black swan can make the pain even more obvious and may hurt sentiment further. Caution is advised. Sector speak – IT is a smart sector in times of volatility. It can be a good place to hide. Stocks would be relatively stable. NIFTY IT index has corrected and can be poised for a decent upmove. Metals are looking unstable. NIFTY METALS in on shaky grounds. If it does not take out its recent highs the sector will be badly hit. A revisit to 3500 is not ruled out. NIFTY BANK stands at a very critical levels of 25000. It was the last top to be broken. Some demand is likely to enter – having said that it is a scam struck sector. Catching a falling knife is not advised. Watch for 25000 and how the index behaves around these levels.